Find all PS4 Game Download Code stores and prices to download and play Cyberpunk 2077 at the best prices on Playstation Network. Save time and money: Compare PS4 Game stores. Activate Cyberpunk 2077 Game Code on PSN to download your PS4 game. You can participate to these tests by adding comments about your PS4 Game Code purchase in the store review page. Enjoy the best deals for Cyberpunk 2077 Game Code with Allkeyshop ! Cyberpunk 2077 is an action–role-playing game published and developed by CD Projekt for the PS4. You are V, a highly customizable character who explores a mountainous open world doing quest and earning in game currency. Beware of your selections because there are repercussions for every decision you make in the game. Be mindful of everything you do as even your attire determines how well interactions with Non-playable characters(NPCs) go. Forge relationships with NPCs and terminate them as you please. Attain new skills and new weapons as you level up and complete missions. Become a friendly, monogamous romantic and or a heartless polygamous savage. Dictate your own play-style. US BOX GAME : This is an US import of Cyberpunk 2077 PS4 in Box Edition (DVD-CD ROM). This is not a downloadable product. Please read the sellers page for any additional costs (taxes, shipping), delivery time for your country and languages available. EUROPEAN BOX GAME : This is an European version for Cyberpunk 2077 PS4 in Box Edition (DVD-CD ROM). This is not a downloadable product. Please read the sellers page for any additional costs (taxes, shipping), delivery time for your country and languages available. 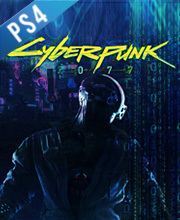 PLAYSTATION CODE : This a Playstation Game Code to download Cyberpunk 2077 PS4. Activate the code on the Playstation Network. Read carefully the store description about any language and region restrictions. BOX GAME : This is Cyberpunk 2077 PS4 Box Edition (DVD-CD ROM). This is not a downloadable product. Please read the sellers page for any additional costs (taxes, shipping), delivery time for your country and languages available.